India drives gold prices, and a recent political shift there has brightened the outlook on gold in coming months. You see, the world's second-largest population (1.237 billion people, compared to the third-largest of 313.9 million in the United States) can't seem to get enough of the yellow metal. Of the estimated 167,550 tons of gold mined throughout all of history, some 34,170 tons are in India. That's 20% of all the gold ever produced. "With the collapse of the rupee, it's been both wise and prudent on the part of Indians to own gold. To 1.2 billion people, gold represents savings and security," Money Morning Resource Specialist Peter Krauth said. "My guess is there's more gold in India than anywhere else." 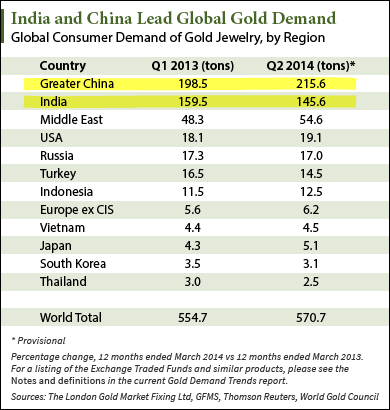 India houses the world's second-highest demand for gold. Together with China, it accounts for more than half of global consumer demand for gold, which is calculated by demand for jewelry, bars, and coins. India's and China's strong affinity for gold underpins world gold prices. 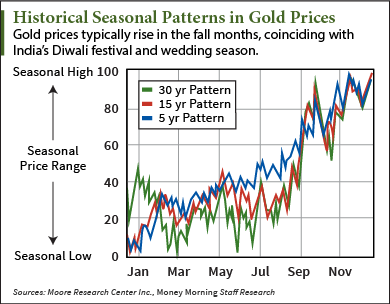 It also drives seasonal patterns in gold. The price of gold tends to rise in the September-December period, driven up by heightened gold demand in India during the country's wedding season and Diwali festival. "The fall is typically a very robust gold-buying period. The all-important wedding, festival, and harvest seasons are quickly approaching," Krauth said. From May 1 to Aug. 20, 2013, the Indian rupee lost a staggering 20%, reaching all-time lows versus the U.S. dollar. This record-low rupee exchange rate pushed the gold price in India up almost 35% at the same time, to new record highs. Indians were buying so much gold – mostly via exports – that it exacerbated the nation's current-account deficit, putting it at a record 4.8% for 2012. Short of banning the sale of gold outright, the Indian government tried nearly everything to slow gold purchases. 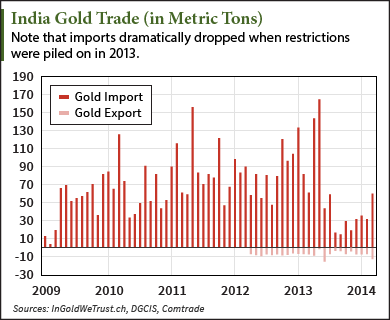 First, it imposed import duties on gold. Then it hiked those duties three more times – all the way to 10% in 2013 alone. Still not enough, on Sept. 17, the Indian Ministry of Finance raised gold jewelry import duties from 10% to 15%. It imposed an 80-20 rule, by which a minimum of 20% of all gold imported had to be exported before further imports could be made. Reuters even reported that the Reserve Bank of India (RBI) was planning to "ask banks to offer to buy household gold and divert it to precious metal refiners in an effort to reduce India's current account deficit and improve the domestic supply of gold." As a result of the government's action, higher rupee gold prices and ever-increasing gold taxes weighed on demand. 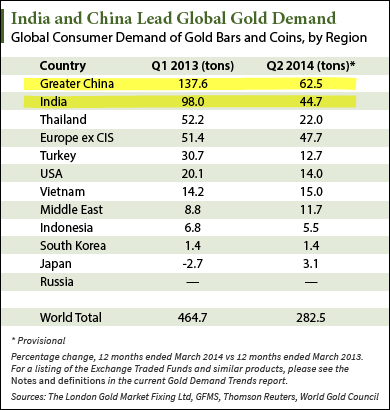 Indian gold imports fell considerably in the latter half of 2013, dropping to 30% of former levels. According to Kitco, around 1,200 tonnes of gold was expected to be imported into the country for the year, but only 825 tonnes in total were imported.